The Arena: a vast alien otherspace that all species were forced to enter when they discovered faster-than-light travel. The Arena: where the lives of entire species might hang in the balance in a single Challenge. The Arena: filled with mysteries, alliances, betrayals, opportunities, and hideous dangers for individual and empire alike. And the only thing you couldn't do . . . was refuse to play the Arena's game. Ariane Austin and her crew had learned these lessons the hard way, and--with luck, skill, and sheer will, had managed to survive so far. But now a debt of honor to Humanity's oldest, if sometimes self-serving, ally Orphan has come due. The threat of war looms with the xenophobic Molothos, one of the five Great Factions; the dark and omnipresent legacy of the Hyperion Experiment lingers. As Leader of the Faction of Humanity, Captain Ariane Austin had to deal with all of these problems, and deal with them soon. For within her was also the alien power that the Shadeweavers and the Faith had sealed away--with a seal that would not last forever. She needed to find a way to control that power before it broke free--or more than just Humanity would pay the price. 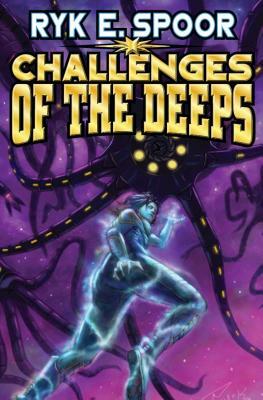 Now Ariane must travel with Orphan into the legendary Deeps of the Arena, far from any known Spheres--to a destination only the enigmatic alien knows, leaving behind one of her most trusted friends and advisors to confront whatever new trials the Arena may throw at Humanity in her absence.
" E]xciting adventure, scary monsters, strange gods, and wondrous magic." --Lawrence Watt-Evans.